Sir Richard Hadlee was born on 3rd July 1951 in Christchurch, New Zealand. After making his test debut in 1973, Hadlee went on to become one of the greatest fast bowlers and all rounders of all time. A fine bowler with the new ball, Hadlee was also the master of conventional swing bowling and could constantly produce near perfect deliveries that would leave even the finest batsmen of his generation lost as to how to combat his unique style. As one of the four top all rounders of his time, the others being Imran Khan, Kapil Dev and Ian Botham, Hadlee was without a doubt, the best bowler of them all, but his batting was not in the same class as the others. Over an outstanding 20 year career that saw Hadlee represent Canterbury, Tasmania, Nottinghamshire and of course New Zealand, he took over 1000 wickets and scored over 7000 runs. Trapping Australian rival Alan Border LBW in 1986 saw Hadlee claim his 300th test wicket and 4 years later in 1990 he became the first player to reach 400 test wickets when he dismissed India’s Sanjay Manjrekar. Hadlee then announced that, at 39, he’d be retiring after New Zealand’s upcoming tour of England. Shortly before the 2nd test at Lords in June 1990, it was announced that Hadlee would be knighted for his services to cricket. He celebrated the achievement by scoring 86 in NZ’s first innings and winning the man of the match award. He ended his illustrious career by taking 5 wickets in his final bowling performance including the wicket of England’s Devon Malcolm in his last ever delivery. 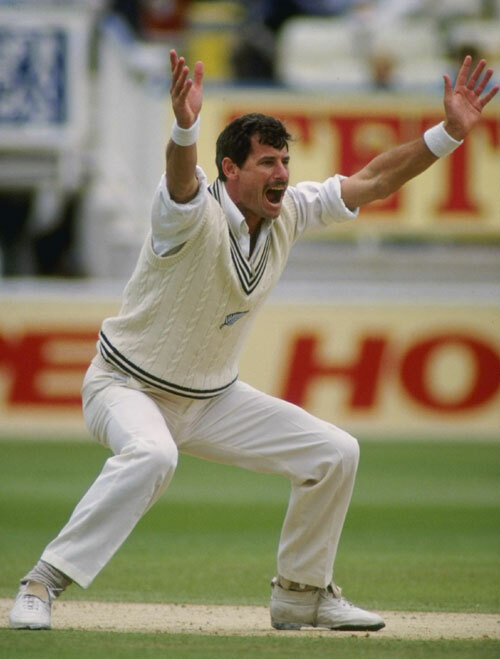 Hadlee’s 431 test wickets were achieved at an incredible bowling average of just 22.30 and he took 5 wickets in an innings on 36 occasions. Sir Richard Hadlee is one of New Zealand’s sporting greats but also, without doubt, one of world cricket’s greatest ever players.